on your journey of faith, you are welcome here. This week’s message is about membership and engagement. It’s evident to all of us that attendance at worship has declined in the last four or five years, from an average Sunday attendance (ASA) in 2015 of 607 to 525 in 2017. It’s not a trend any of us want to see. I am committed to nurturing every member of St. Paul’s in faith, and when people choose not to attend, it means that we are not reaching them in a meaningful way, and that is something we need to address. I am always saddened when a familiar face is absent from the table, and often we don’t know exactly why they are absent. The measurement of membership in the Episcopal Church is not an exact science. We don’t take individual attendance, we don’t require people to tell us when they leave, or their reasons for leaving, and we don’t require people to record their baptisms with us, although we encourage it. At present the best measure of membership that we have is in the pledge numbers. If someone pledges, I know they regard themselves as members of Christ’s body in this place. If they stop pledging, there can be several reasons including financial hardship or relocation. The numbers of pledges recorded tell a story: from 400 recorded for 2015 to 313 for 2018 (to date). Despite the drop in the number of pledges, we have almost maintained the total amount in dollars pledged, which means that those who pledge are both generous and committed. This being the case, only a small portion of our budget gap can be traced to the drop in pledges (see my previous letters on this topic). However, we are unlikely to correct the deficit unless we address the questions of both attendance and pledge numbers. Jeff has called together a small group of longtime, trusted parishioners to reach out to those whom we miss, with the hope of gathering data to tell us more about why people have drifted away from St. Paul’s. The literature tells us that younger people tend not to place a high premium on belonging to an institution, so we are also dealing with a changing concept of membership. I know that the many staff and clergy transitions over the last six years have been hard on you all, and life continues to get ever more crowded with multiple worthy options competing for our time and contributions; people simply attend church less frequently than they used to. We have harnessed technology to address the busyness, with live streaming and video recording of principal services, and the development of Faith to Go for families (here’s a link to this week’s offering: http://www.stpaulcathedral.org/connect/cyf/faithtogo1/) . Since I arrived in 2014 the staff has been engaged in building structures and systems to make our ministry more transparent and sustainable; perhaps this focus has had its effect on our common life and thus on the “glue” that holds us together. We all care deeply about the life and future of St. Paul’s. We are in this together, and I need your help in discerning a way forward. If you have ideas or thoughts, please share them with me. And please come to our next quarterly Community Life Council gathering on Wednesday May 15 at 6:00 pm in the Guild Room, to join in the conversation over a light meal. (Please RSVP to Judy in the cathedral office so we can plan for dinner). There is good news: the recent Holy Cow survey told us that St. Paul’s is still well within the healthiest and most vibrant quadrant for ministry and mission compared to churches across the spectrum of size and theology. And we have nearly 350 people engaged in active ministry at St. Paul’s, from choir members to Showers workers to forum attendees. That is quite extraordinary! Let’s work together to strengthen our community and to make our cathedral a center of exciting and compelling ministry for all who know us. Thank you for your continued commitment as we seek to Love Christ, Serve Others, and Welcome All. The elephant in the Sanctuary is the very narrow music support to worship. it is well done, but hardly representative of Christendom 2018. 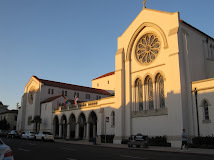 Welcome to the Blog of St Paul's Episcopal Cathedral in San Diego! This site gives our community a voice to discuss issues of moment, a space to reflect on their journey, and a place to connect with our community. Contributors All members of the community are invited to join in! Simply send an email to StPaulBlog@gmail.com with your text. We welcome anything from spiritual reflections to light-hearted stories to community events. We also love pictures, and we encourage authors to send a photo of themselves. We are also happy to have you quote or link to the blog! Please be sure to cite/credit our authors properly. Comments You can comment on any post. No need to sign up for Google; you can post as "anonymous" (though please be sure to sign your comment). The Moderators will delete inappropriate comments at their discretion, so if you feel heated about something, consider Romans 12:17-19, Ephesans 4:29, and Matthew 5:22 before commenting. For more detailed info on how to comment on the St Paul's blog, click here. For more information about using the blog, twitter, or facebook to connect with the Cathedral,click here. We also have suggestions to keep your experience online secure. Who are all those people on the altar? Find out in the field guide to the processional!